Until recently, only five randomized clinical trials (RCTs ) had been published on the effectiveness of induced hypothermia in recovered cardiac arrest, one of them only in abstract form. They were small size (figure), and suffered from methodological limitations. Two previous meta-analysis, carried out on four  and five  of these RCT concluded that hypothermia decreased mortality and increased the likelihood of brain function recovery, not taking into account the uncertainty arising from the limited available evidence, as shown in a third meta-analysis . Empiric studies have shown that disregarding the inaccuracy derived from a small sample size in relation to the magnitude of the therapeutic effect can be misleading in many meta-analysis , and erroneously inform clinical practice guidelines. Recently a new randomized clinical trial  on hypothermia in cardiac arrest has been published , which, besides being less prone to bias and more consistent with current standards of therapy than previous, includes many more patients, changing the sign of the summarized evidence . Nielsen study alone provides twice as many patients than all previous studies combined. The most recent clinical trial (Nielsen 2013) includes almost four times more patients than the previous largest (HACA 2002). 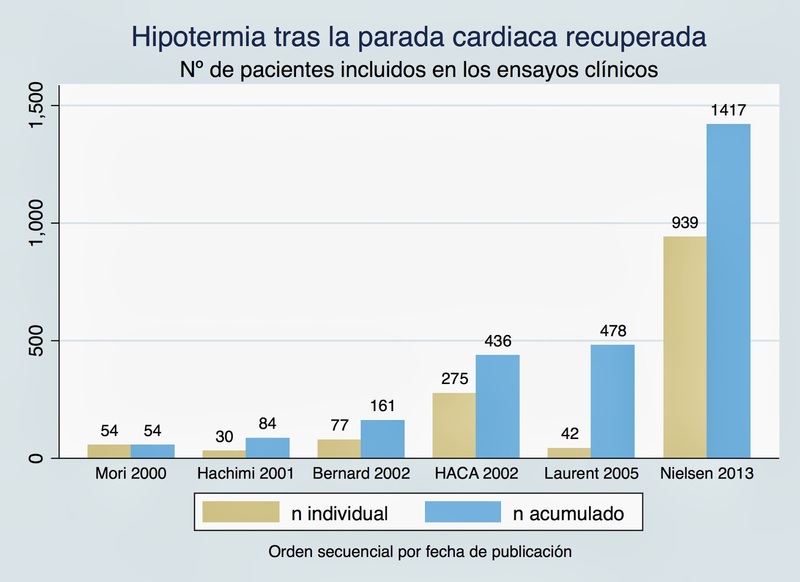 The total number of patients included now in the updated meta-analysis has been tripled by Nielsen study (Figure). Eduardo Palencia Herrejón, Hospital Universitario Infanta Leonor, Madrid. Domingo Díaz Díaz, Hospital Universitario Infanta Leonor, Madrid. Ramón Díaz-Alersi, Hospital Universitario Puerto Real, Cádiz. Ferran Roche Campo, Hospital Verge de la Cinta, Tortosa (Tarragona). © REMI, http://medicina-intensiva.com. Enero 2014.